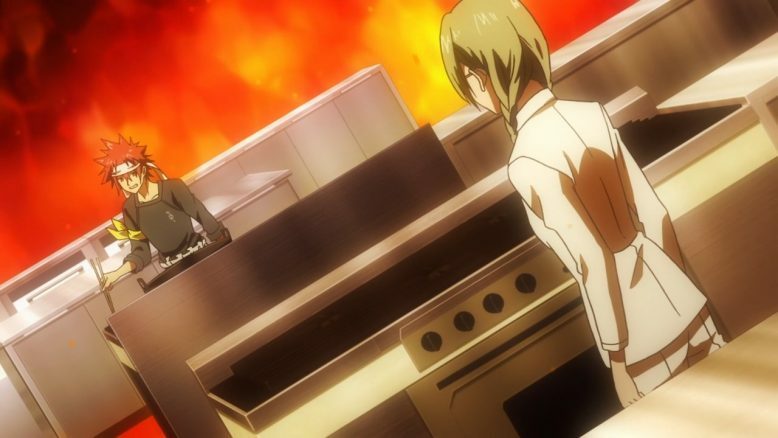 Its quite fitting that the penultimate episode of this season of Shokugeki no Soma be a rather safe and comfortable one. This is Shokugeki no Soma in its comfort zone, confidently and effortlessly doing what it does best, which I think is a decent enough start to this battle Royale between The Elite Ten and Soma’s group. Could there be more fanfare or more exciting developments happening here? Perhaps, but after so many episode that have been good but flawed, it was nice to just see the show settle into its old groove. The classic clash of ideals, the good looking and creative food, the great character moments and the interesting if somewhat predictable competition itself, all worked fairly well. The one thing in particular that’s worth appreciating about this week’s Shokugeki match, was how Isshiki won his particular bout. Yes, there was never any doubt as to whether Isshiki would emerge victorious or not, but what I was curious about was how he’d do it. To that end, I don’t think the show or Isshiki really disappointed. 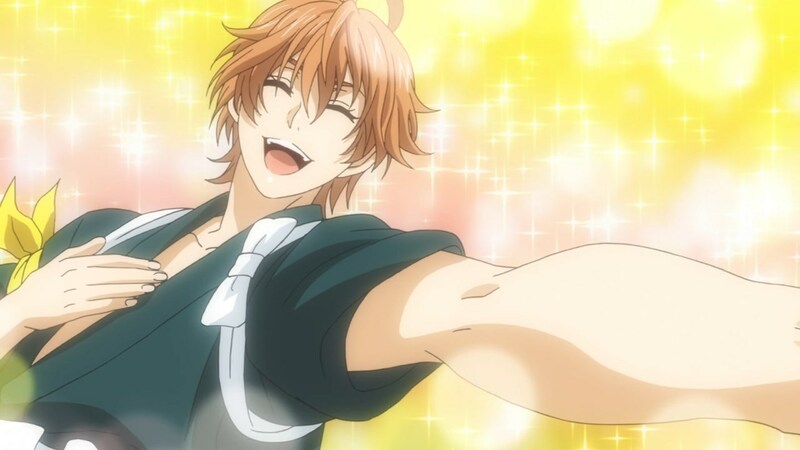 For a character that’s been little more than the naked apron comic relief, it was nice to see Isshiki take all the ingredients and hard work from all his Polar Star Dorm Kohai (Junior clansmen) and use it to great effect. To the kids who were to embarrassed and dejected to even show up, Isshiki really redeemed and honored them with his use of their hard work. 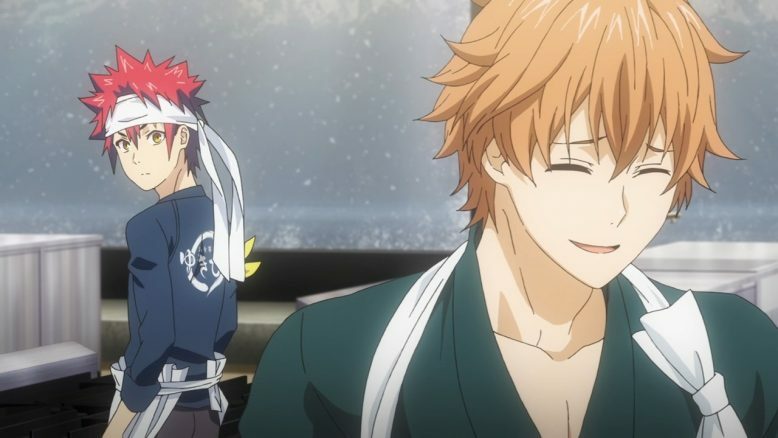 Lest we forget this team Shokugeki is all for these kids, the creative diamonds in the rough that need the support and the learning environment that Totsuki provides, to succeed and flourish. 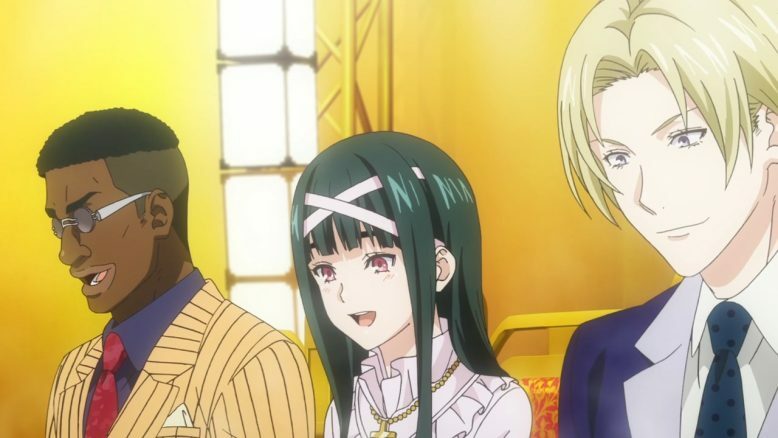 Geniuses like Soma, Isshiki and Erina are certainly noteworthy, but there’s something entirely special about those that work beside them and try their best. 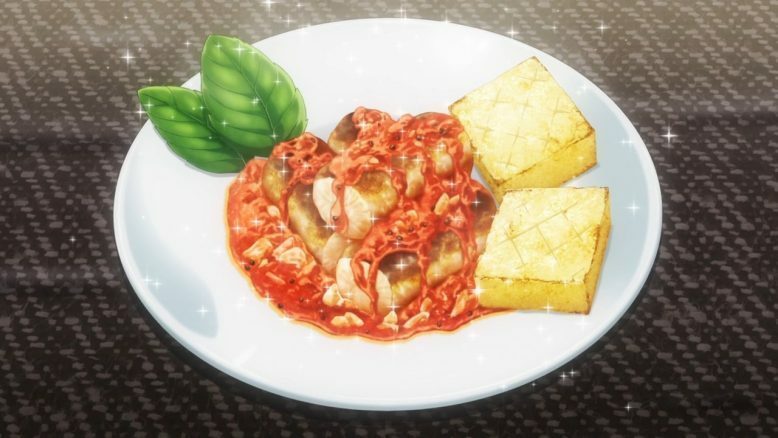 The fact that Isshiki’s dish was both creative and featured all of the ingredients from his underclassmen and dorm mates, well it makes a very strong point. There is a place and need for these kids, and its best to just provide them an environment where they can freely experiment and learn from one another. Ironically, this very fact actually speaks more to Azami’s particular beef with Totsuki than anything else. 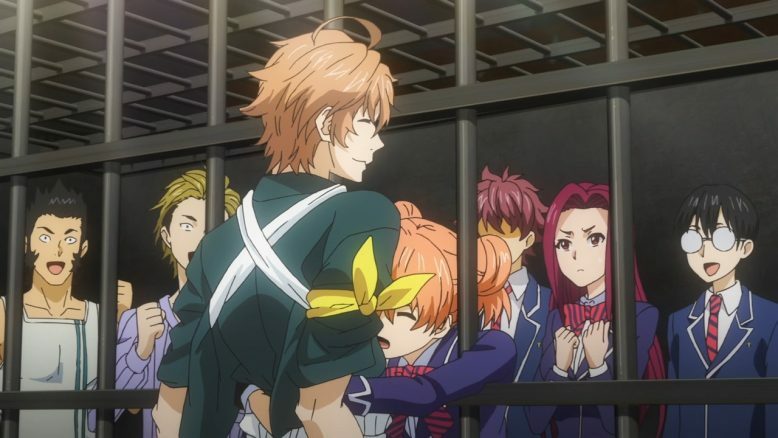 See, as we learned two weeks ago, Totsuki is NOT a great environment to be in. Heck, this is a particular theme that I’ve noticed and harped on since the beginning of this series. Given the right environment, gifted kids like the Polar Star Dorm students can excel and achieve greatness. They just need support, and the ability and opportunity to be able to fail safely. That’s what school should be all about, giving students the chance to discover themselves and to grow in interesting ways. A text book or a video can provide raw information, but its the experience in a controlled ideal environment that I think academia as a whole fails to focus on. 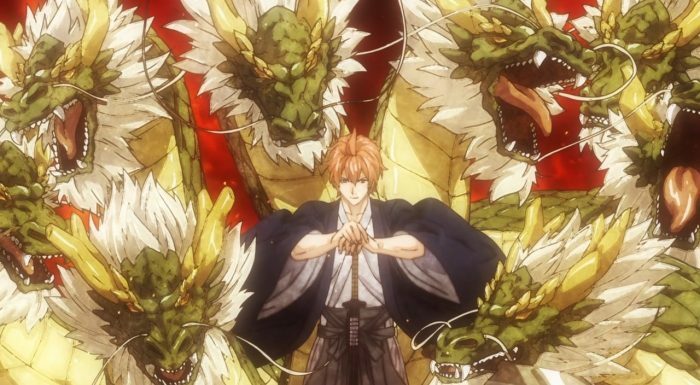 So Isshiki winning this bout with his creativity, skill and the hard work of his friends argues for the fact that Totsuki needs to evolve and change. It also, of course, argues against Azami’s reaction to Totsuki, which is to basically lock down growth in favor of pure, cold fact accumulation. Simply absorbing information is NOT the answer to the problem that Totsuki as a learning institution faces, but rather its the exact opposite that needs to be embraced. Which, I can’t help but think is all intentional. Both directors whether Azami or Senzaemon, are very much in the wrong with how they operate. If one thing is clear, its that Totsuki needs to adjust and change, and I wonder if this little skuttle but between these two very extreme opposing views, is not a critique on the larger extremely rigid structured society of Japan. I can’t know for sure what the intention is here, but if anything else, it seems that the adults are very much not doing their job with regards to helping the young generation grow and become capable. So we’re at this interesting point, where Soma and his group are basically fighting against both Azami, and to a lesser extent the more cutthroat, unfair status quo of the old Totsuki as well. I’m curious to see if Shokugeki no Soma actually dives into this particular conundrum that its been hinting at for so long. Do the mangaka behind this story actually support a place like Totsuki? Is this Azami arc meant to provide context to the rigorous style of Totsuki’s teaching? Or is there a middle ground here? I’m not sure, but if one thing is for certain, I don’t believe we’re going to get very with this particular idea this season. The second last episode, the one from this week, featured Ishiki basically being entirely badass and showing off his skills while protecting and raising the honor of the underclassmen and friends that he loves and admires so much. Next up is Soma versus Nene, and it seems that while Nene seems to have some history with Isshiki, it’ll be Soma that provides some harsh lessons and learning for the skillful but overly arrogant Soba chef. Speaking of arrogance, I should note that this week also introduced the “WGO” and a bunch of pretty forgettable, annoying judge characters. I have to admit that with every Shokugeki the quality of the judge characters seem to be dropping. I’d rather we stick to the semi-regular judges we used to get before this whole Azami arc came into play. There was something very relatable and human about seeing these generally normal people try and make sense of the food that they were served. Adding more and more outlandish prestige while not really developing these new judges, makes the whole thing feel pretty darn hollow. As for the finale next week? Well I’m not really sure what to make of it. Soma will probably win, but there’s a part of me that’s still waiting for that one moment where he does lose. Could that be a special moment to end the season on? Perhaps, but I think its more likely that we’ll get another episode much in the same vein as the one we got this week. It’ll be nice, it’ll be good, but it’ll be more or less like comfort food. Maybe that’s all we really need at this point, as this third season of Shokugeki no Soma winds down.